Cereals have been an essential part of the human diet since the beginning of agriculture. They have played an essential role in world history and the evolution of certain civilizations coincide with the cultivation of cereal grains. Cereals used for human consumption belong to the grass family and are seeds of matured plants, in which nature has stored the elements for the germination and growth of the germ such as starch, fat, protein, organic mineral salts and vitamins. The important cereals cultivated all over the world are rice, wheat, corn, barley, oats and millets such as ragi, sorghum, bajra, Italian millets, etc. These constitute the most important article of human food not so much on account of their superior nutritive value, but chiefly because of their prolific growth and abundant production in all civilized countries throughout the world. The variety of cereal grains produced in various countries depend largely upon the climate and the habits of their people. Various cereals are the staple foods in different countries and each country has its different cereal culture. Wheat makes the most significant contribution to diets in many European countries and India. While rice is the most important gram consumed in far East, China, Japan and India, Maize is the main staple food cereal in Africa and central America and Millets and sorghum are in India and Africa. These global differences are mostly due to the climatic conditions in tropical and subtropical regions. Even though they are often called as “staff of life”, they do not deserve the term as even if eaten in their natural state, man cannot thrive for indefinite length of time exclusively on cereals and retain best of health. 1. Cereals are most economic source of energy. They provide about 30 percent of total calories eaten in the west, however this figure rises dramatically in parts of rural Asia, Africa, and India where cereals supply 70 to 80% of energy requirements. Since cereals are the cheapest widely available source of energy their contribution in energy intake is highest among poor income families as all cereals are rich in starch and provides energy and heat. 2.They provide both soluble and insoluble fibre such as pectin, cellulose and hemicellulose which are mostly present in the pericarp and bran etc. and helps to improve peristalsis in the intestine and bulk to the stools. Fibre helps for slow release of glucose from food and maintains sugar levels in the blood. 3. Protein : The protein content of different cereals vanes. Rice contain less protein compared to other cereals. The protein content of different varieties of the same cereal also varies. Proteins are found in all the tissues of the cereals grain. Higher concentration occurs in the embryo, scutellum and alleurone layer than in the endosperm, pericarp and testa. Within the endosperm the concentration of proteins increases from centre to the periphery. The types of proteins present in cereals are albumins, globulins, prolamines gliadins and glutelins, which are known as “Gluten” proteins. The gluten has unique elasticity and flow properties which are mostly present in wheat grain than other cereals. Cereals contains 6-12% protein which is generally deficient in lysine. Among cereal proteins rice protein is of better quality than others. 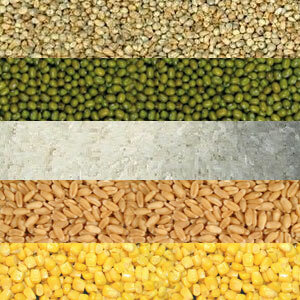 Cereals when consumed with pulses, the protein quality improves due to mutual supplementation. Pulses are rich in lysine and deficient in methionine, where as cereals are rich in methionine. 4. Fats or lipids : Lipids are present to the extent of 1 -2% in wheat and rice and 3% in maize. More lipids are present in germ and bran than other parts of the grain. The lipids are mostly the triglyceride of palmeteic, oleic and linoleic acid. Cereals also contains phospholipids and lecithin. Considering the amount of cereal consumed, it is estimated that fat percent in cereals can meet more than 50% of our essential fatty acids daily requirements, when consumed in whole cereal as food. Being plant origin, cereals do not contain cholesterol and fats and are in poly unsaturated forms. 5. Minerals : About 95% of minerals are the phosphates and sulphates of potassium, magnesium and calcium, a considerable part of phosphorous in cereals is present in the form of phytin. Phylates in the cereals decrease the absorption of iron. Unrefined cereals contain more phytates than refined cereals. On germination of cereals phytates reduces due to the enzymatic breakdown and iron availability is improved, so malted flours of cereals are more nutritious than raw flour. Some mineral elements like copper, zinc and manganese are also present in very small quantities in cereals. Cereals, except ragi are poor source of calcium and iron. Particularly rice is very poor source of calcium and iron. Millets, ragi, jowar and bajra are rich in minerals and fibre. 6. Vitamins : Whole grain cereals are important source of vitamin B in our diet. Since most of these vitamins are in the outer bran, refining reduces vitamin B content. Cereals do not contain either vitamin A or C except maize which contains small amounts of carotene. Oils from cereal grains are rich in vitamin E. Rice bran oil is richer in vitamin E than other oils. 7. Enzymes : Cereal grains contain many enzymes mostly of amylase, protease and lipases and oxido-reductases. On germination amylase actively increases. The proteases are relatively more in the germ. Nutritional value of cereals mainly depend upon the degree of milling, polishing or refining and also the changes they undergo in the preparation of food like washing the grains before cooking. Soaking and method of cooking etc. As oats, barley, rye and millets are usually only lightly husked and most of the whole grain is eaten they supply good amount of fibre, minerals and vitamins. Of all the cereals wheat is richer in protein than other cereals. Why cereal grains are eaten ? 1. Cereals promote age reversal by virtue of their rich supply of vitamins B and E, essential fatty acids and lecithine, which allow the body tissues to better use of oxygen. These also help to provide good protection against heart diseases. 2. They are also good source of high quality proteins. 3. They are also potent source of minerals especially calcium, phosphorous, magnesium, iron and zinc. The high phosphorous content is helpful, as it is an important component of brain tissue. Generally fruits & vegetables are poor source of phosphorous and cereals supplement this deficiency. Why grains should be eaten in moderation? Most grains are acidic and produces an acidic state in the tissues and blood. Excessive eating promotes premature ageing and predisposes the body of certain diseases like arthritis. Grains are relatively hard to digest than fruits, sprouts, salads, and cooked vegetables. This wastes a lot of body’s energy so in chronic disease conditions, it is better to reduce or avoid cereals consumption for some period for recovery. Cereal grains need to be cooked since their starch is hard to digest in natural form. Heating food destroys the vitamins, minerals and enzymes in the diet. So steam cooking or baking is better than frying and cooking at high temperatures. In case of irritable bowel syndrome, celiac diseases, etc., whole grains cereal fibre aggravate disease conditions in some people. Care should be taken accordingly in such cases to consume cereals in quantity and quality. Sprouted grains : Sprouted grains lack the acid forming properties and instead produce beneficial alkali state in the body. So it is always better to soak cereals like brown rice, etc. in water for 2 to 3 hours and then cook. Other grains like wheat sprouts, wheat sprouts milk, ragi malt are good for health. Cereal grains need to be cooked since their starch is hard to digest in natural form. Heating food destroys the vitamins, minerals & enzymes, so steam cooking is to be preferred. Oryza Satitva (Botanical Name) Tandula (sanskrit), Chaval (Hindi /Urdu), Uruz (Arabian), Birinj (Persian), Akki (Kannada), Vari (Telugu), Ari (Malyalam), Tandool (Marathi), Charnoor (sindhi), Shahi Dhaniya (Bengali), Arisi (Tamil). Rice is one of the most popular cereals that is extensively grown all over the eastern world starting from India to Japan. It is the staple food for hundreds of millions of people in India, Burma, China, Japan, and other oriental lands. It is the next most widely used of all cereals next to wheat. There are number of varieties of rice. Its nutritive value is high and its productivity is great. Rice cannot be grown in cold countries. Rice is available as milled, unpolished, polished, parboiled, flaked and puffed rice. Rice is a bland grain of great versatility. It blends with many items of food. The nutritive content of rice is influenced by variety, the kind of soil in which rice is grown and by the applications of organic fertilizers. The degree of milling also determines the amount of nutrients removed. Description: Rice when harvested has a thick and woody husk of no food value. The grain itself consists of three parts. The outer layer (bran) of grain, which include the pericarp or seed coat with the underlying aleurone layer. When just husk is removed the bran remains attached to the grain. This is brown rice, which is high in fibre. White rice is produced by milling to remove the pericarp, aleurone layer and germ. Nutritive values: 100 grams of brown rice provide 141 calories of energy where as white rice provides 138 calories. The major carbohydrate of rice is starch which is about 72-75%. Whereas the amylose content of starch varies according to the grain type. The fiber of rice is the hemicelluloses. Brown rice is a good-source of fiber. Rice protein is superior to wheat (85-95%) and also easily digestible. Proteins, fats and minerals are present in greater quantities in the germ and the outer layers than the starchy endosperm. Brown rice is a good source of vitamin B group such as Thiamine, (B, 1) riboflavin (B, 3) niacin and minerals potassium, iron, phosphorous and magnesium. The amount of fat soluble vitamins A & D in rice are negligible as in other cereals. The vitamin C is practically absent, but poor in riboflavin and minerals, iron and calcium. Parboiling nee helps the B vitamin to migrate from the bran to the grains where they are trapped. Polishing of rice reduces B vitamins content to different degrees depending upon the degree of refining. Highly polished white rice is very low in B vitamins. As cereals are also source of B vitamins eating of white rice causes B vitamin, Folic acid, and niacin deficiency diseases. Rice is deficient in lysine and threonine aminoacids. The biological value of rice protein is 80 where as wheat protein has 66 and maize protein is 50. Partial replacement of eating only rice with other cereals and millets is needed to contribute other minerals and vitamins. For supplementation of vitamin C, good quantity of fruits and vegetables has to be taken daily. Include sprouts in diet. Green leafy vegetables are good sources of calcium with milk or buttermilk in rice diet. 1. For Energy Deficiency: The body can digest and absorb the carbohydrate in rice relatively quickly. Rice is therefore a useful food to eat in order to refuel. The muscles with energy after physical activity. Brown rice also supplies magnesium which is required for muscle tone and protein synthesis. 2. Nervous & Metabolic Disorders : The B vitamins found in brown rice are able to keep the nervous system in good condition and to aid the conversion of blood sugar into cellular energy. Eating white polished rice is one of the causes of diabetes, heart diseases and obesity. 3. High Blood Pressure: Brown rice in particular supplies potassium which is needed for maintaining water balance and keeping blood pressure down. It contains virtually no sodium, which has the opposite effect. People with high blood pressure can include brown rice (without salt) in their diets. 4. High Blood Cholesterol: Oil made from the bran of rice contains a number of substances that together are described as “oryzanol” oriyzanol reduces cholesterol absorption and synthesis. 5. Cancer of the Colon: Brown rice may decrease the risk of colonic cancer. This is partly the rice bran helps to bulk the stools and speed up the muscular contractions of the intestinal wall. Carcinogens in the stools have less time to stick to the colon wall where they can trigger cancerous changes. 6. Proteins quality: Protein of rice is easily digestible and assimable and also when combined with other vegetable proteins like pulses and leafy vegetables, it becomes a valuable protein for growth and repair and also who can not tolerate gluten (protein) of wheat with colic diseases. 7. In traditional herbal medicine rice is used to settle digestive problems like diarrhoea. It is an ideal food for any one recovering from a bout of sickness, as it is soothing and non irritant. Rice water is used to treat feverish and inflammatory conditions such as digestive complaints, cystitis and urinary tract problems. Powdered rice flour or rice starch, may be applied as a poultice to wounds, bruises and irritated skin. Cooking and serving methods : Rice is usually boiled, steamed or oven cooked or fried, Parboiled and made into flakes and puffs. Rice is incorporated into or used as a base for a wide variety of savoury and sweet dishes. Rice pudding with milk and jaggery is very delicious. Brown rice requires longer cooking time than white rice. It is always better to presoak the brown rice for 2 to 3 hours before cooking for softness and easy digestibility. Soak 1 cup rice in 2 cups of Water and, then cook or steam. Never throw out excess of cooked rice water after cooking. Wash very minimum before cooking once only to remove dust with moving fingers. Excess of washes with water removes all remaining B Vitamin, thiamine & riboflavin contained in small quantity in polished rice, idli made with combination of 2:1 with rice and black gram after fermentations is easily digestible and nutritive, rice flakes (poha) and rice puff (murmura) made with brown rice are very nutritive and easily digestible. How much to eat : 100 to 150 grams of cooked brown rice provide good amount of carbohydrate calories & also daily fibre requirement. Choosing and storing : It is always better to store rice as paddy and when ever required it is dehusked or powdered or milled to remove the husk only. Ageing the 6 to 8 months old paddy or rice, after cooking retains individual grains and not become sticky after cooking. Triticum sativum (B.N.) Godhuma (San) Gehun ((hindi, urdu, dak), jauo (urdu) Godhi (Kan), Godhumalu (Tel), Gadomay (Tam), Gahu (Guj.Mar) Gotampu (Mal) Ghama (ori). Wheat is one of the most commonly consumed cereals in the world providing about 70 percent of the caloric intake in the form of staple food. Although its origin is the subject of some debate, it is likely that wheat was first cultivated from wild species in south west Asia in about 8000 B.C. of the two varieties, hard wheat is rich in protein and is used principally in breads and pastas. Soft wheat has a lower protein content and it is used mainly to produce cakes, biscuits and pastry flours. Durum wheat is an excellent sources of niacin, magnesium, potassium, phosphorous and zinc. Endosperm: It is the inner spongy structure of the wheat that is filled with starch and micro particles of protein in the form of gliadin and gluetnin that are singularly known as “Gluten” which is about 12% in the grain causing the elastic structure of the wheat flour. Except rye, Wheat is the only cereal that contains gluten. Being poor in lysine, it needs addition of milk or soya flour etc some time for nutritive value of wheat preparations. Aleurone layer: Aleurone layer envelops the endosperm but it is under the Brany layer. It is rich in protein but usually lost along with bran during milling the grain as it is firmly attached to the outer layer. Pericarp or the bran: Above the Aleurone layer there is another covering which is again divided in two cellular layers (outer and inner layer) the outer layer chiefly consists of cellulose impregnated with iron, calcium, phosphorous, magnesium, silica, etc. the inner layer contains a pigment of high brown that gives colour to the wheat. Bran is very useful part of the wheat which prevents constipation due to its cellulose content that forms a bulk mass in the intestines. It is also rich in phosphorous in the form of phytate which interferes with the absorption of iron and calcium. Scutellum: It is a thin layer at the base that divides the grain from endosperm and the germ. It consists of high concentration of vitamin B.
Embryo or Germ: It is situated at the base of the grain. It is rich in vitamin B and E protein and fat. It is removed generally during milling as it spoils the wheat flour due to its fat contents. However, the bran and germ proteins have a higher content of essential aminoacids than inner endosperm proteins. Wheat is consumed mostly in the form of flour obtained by milling the grain while a small quantity is converted into breakfast foods such as wheat flakes and puffed wheat. Whole wheat products have a distinctive flavour and coarser than those made with white flour and some time needs good storage conditions to avoid rancidity. Best ways of consuming wheat: The best way of taking wheat is in the sprouted form chewing it well or adding to salads, which supplies easily digestible proteins, enzymes vitamin B, and E and simple starches. For many as it is not practicable the second best way is in the form of mash (Dalia) or rough porridge where the grain is just broken into tiny particles. The third best way is the whole wheat flour produced by a slow moving mill or grinding between two stones (chakki) comparatively with very low speed, which helps to retain all valuable nutrients in its flour in which no bran or any other portion is removed. It is laxative and the cellulose is more easily broken down by the bacteria in the intestines. The Iron content of wheat bran is more effective in the production of haemoglobins and useful to anemic patients. Avoid all refined wheat floor preparations which are constipative, low in nutrition and cause obesity diabetes, celiac diseases, etc. Stress: Wheat germ carries a factor which helps to bear the stress. Wheat Germ Oil: It helps in the irregular menopausal symptoms and improves stamina and strength. Add wheat grain oil to salads, soups and wheat germ to porridges and soups. Wheat Grass: Juice contains rich chlorophyll, betacarotene and many minerals, vitamins, 18 aminoacids and rich in magnesium. It is nature’s concentrated nutritent. Helpful in the treatment of cancers, anemias and low vitality and undergrowths etc and increases general stamina and vitality. Blocked Arteries: Inclusion of wheat germ in the diet may improve the long term In take of vitamin E and help to stop the oxidation of low density lipo proteins (LDL) cholesterol once oxidized LDL can block arteries causing heart diseases. Wheat germ helps the intake of vitamin E to prevent and reverse the blockages in arteries. Breast Cancer: Whole wheat products may help to reduce the risk of breast cancer partly that they contain phytosterols (plant based steroids), plant oestrogens that can mimic the hormone oestrogen phyto sterols latch on to estrogen receptor in breast tissue blocking human oestrogen which may trigger breast cancer. Thus lowering the risk of cancerous changes in the breast cells. They increase the movement of stools through the intestines which gives circulating oestrogen less time to be reabsorbed into the blood across the colon wall. Cancer of the Colon: Studies suggest that complete whole wheat products in the diet protect against cancer of the colon. Wheat bran is a rich insoluble fibre which remains intact and undigested until it reaches the colon. It bulks the stools and increases the speed of passage through colon. This gives carcinogens less time to latch on the colon wall and set up cancerous changes. Wheat bran is digested by the bacteria in the colon producing short chain fatty acids. Diabetes: Whole wheat flour -chapatti or breads, or dalia provide slow release of glucose and avoids peak of blood and glucose levels and therefore helpful to control and prevention of diabetes. How much to eat: 100 gram of whole wheat flour preparation supplies half of recommendable dietary fibre and gives 310 calories of energy. Wheat also supplies required amount of selenium. Iron, calcium, vitamin B & E.
Choosing and storing: Buy small quantities of wheat and make flour or premilled flour and use quickly. Store flour in clean, airtight containers in a cool dry place. Makkajowari (Hindi), Makai (Marathi & Sindhi), Muskunjola (Kannada) Mokkajonnalu (Telugu) Makkacholam (Tamil), Butta (Bengali). Maize is also known as corn in India and Indian corn in the United States. Maize or corn is also mostly used in making popcorn, cornflakes, puffed maize, commercial starch, Glucose, Maida, Cosmetic powders and other various food preparations in several countries. In countries like South America, Central America, and Africa, it is converted into food products by grinding, alkali processing, boiling and fermentation. According to the studies of National Institute of Nutrition, Hyderabad, cooking of Maize reduces “aflatoxin” by 17% to 56%. Malted or mixed with milk drinks are very useful for convalescing people as it provides energy and protein to aid recovery and essential mineral, and vitamins in easily digestible form. Chewing fresh roasted corn is very good for the gums and teeth and prevents gastric ulcer and protein deficiencies in underfed children. Corn grains consumed daily help to keep a check on the blood cholesterol level. Corn flour paste in water acts as an effective face pack to remove acne and other skin blemishes. Corn is suitable for people with gluten intolerance of wheat in colic diseases to the intestines and irritable bowel syndrome. Cold pressed corn oil is rich in poly unsaturated fats and helps to reduce heart attacks, arteriosclerosis causing hypertension. Hordeum vulgare (Botanical Name), Jao (Hindi, Gujrati, Marathi), Javegodhi (Kannada), Parle Arsi (Tamil), Barley Biyyamu (Telugu), Yavam (Malyalam), Joab (Bengali), Jabadana (Onya). Barley comes under cereal grains and is a staple food in most countries of the middle east. In other western countries, it is grown for animal feed and for malt extract. It is also grown far south as Egypt and Abyssinia and was one of the staple foods of ancient Hebrews, Greeks and Romans. It constitutes an important crop in Spain and Algeria in Germany and Britain. It is having almost equal importance to wheat and used as pearl barley (a refined form without husk) for culinary and medicinal purposes in Britain. Generally it thrives in greater diversity of climates than any other cereal for cultivation. However, it is less palatable than wheat for most people in all countries. It is rich in cellulose or fibre and carbohydrates. It is rich in Vitamin E, minerals such as calcium, copper, Iodine, iron, magnesium, potassium and rich in amino acid L tryptophan. It is good for digestive and nervous system as it contains an important ammo acid L tryptophan and is helpful for sleeplessness, depression, anxiety and premenstrual syndrome. It contains a substance “hordenine” which is tonic for the heart and have an antidiarrhoeal properties. It is a soothing drink used medicinally to treat children suffering from diarrhoea and sickness. Germinated barley contains enzymes that can relieve loss of appetite and hyperacidity. However cooking destroys these enzymes. So the best way to benefit from the medicinal values of the cereals is to drink, barley water made from germinated barley and if possible should be taken raw for maximum nutritional and health benefits. Barley is a good diuretic among cereals. Barley water made after cooking cereals is very beneficial in all urinary and kidney disease conditions. Barley water is good in chronic fevers such as Typhoid and Malaria as it is a cooling drink and gives proper nutrition. This cereal is being cultivated since long and is an important crop in Europe. Oat grains can be rolled, flaked or made into oatmeal or flour for porridge and bread oatmeal is finely milled oat grains, which contains especially Vitamin E and fat. To stop rancidity, oat meal is heat treated and this prevents lipase enzymes from attacking the fatty acids creating bitter taste. Its gluten content is about equal to barley and rye. Diabetes : Oat contains rich soluble fibre and is digested slowly and releases slowly the glucose in the intestines for absorption. So it is prescribed in diabetic diets to prevent and control diabetes mellitus. High blood cholesterol: Adding oats to the diet may help to reduce high blood cholesterol due to its rich fine fibre content in the grains and helpful to avoid risks of heart diseases and high blood pressure. Oat bran is advised to eat, adding to the meal. Growth and health maintenance: Oats contain good amount of easily assimable proteins and when combined with pulses and legumes, it helps for healthful growth in children and tissue repair in elderly people for maintaining good strength and health. Oat meal face pack is very good to remove dead cells of the facial skin and brings a fresh glow to the skin. Oats contains gluten and can be avoided for gluten intolerance conditions such as coelic diseases of intestines and Irritable bowel syndrome. Elucine Coracana (Botanical Name), Ragi (Hindi, Urdu, Kannada), Kelvaragu (Tamil), Nachani (Marathi), Mandina (Oriya), Ragulu or Chollu (Telagu), Koovasagu (Malayalam). Ragi is also known as finger millet. It constitutes a little over 25% of food grains grown in India. It is widely consumed in Karnataka, Andhra Pradesh and Tamilnadu States practically without refining by the poorer sector of the population. They consume in the form of “Ragi Ball” and unleavened bread. The floor is put in boiling water and evenly mixed then the thick paste is rolled in the form of balls. Ragi ball is mixed with butter milk or with liquid curry of vegetables or pulses. Some times Ragi flour is used to make gruel, malt, dosa and porridge. Ragi malt is very nutritious for children and weak people. Prolonged digestion of Ragi meal helps labourers to work longer times. Due to its rich cellulose it is excellent laxative for constipation. Malt is a good food for children and supplies calcium in good proportions for bone growth and body development. Ragi malt or Ragi preparation foods are good to eat in case of iron deficiency anaemia. Its regular use protects from malnutrition, degenerative diseases, premature old age and increases longevity. Eating roasted green ragi is a tonic for high blood pressure, liver diseases, heart weakness, asthma and lack of milk production in mother after child birth. Prenisetum – typhodum (Botanical Name) Bajn (Marathi), Varjavi (San) pearl Millet (English), Bajra (Hindi), Jari ( Urdu), Combu (Tamil), Sajjalu (Telgu). Among Millets Baira is the predominant crop in India. It is also called as Pearl Millet in Western Countries, it is a wholesome grain which has high nutritive value. It is usually very popular in the States of Maharashtra and Rajasthan in India. Generally people eat in winter season. It has the same quantity of protein as wheat. The protein contains a high proportion of prolamine followed by the globulin and Albumins. Among the ammo acids tryptophan content is high and lysine is low. Bajra is rich in Iron, B vitamins, Thiamine, Riboflavin and niacin. Generally roties made from the fine flour are eaten with various vegetables as main dish. It has some medicinal properties when bread is eaten with honey in the morning. It is specially effective for bleeding piles, epilepsy, insomnia, impotency, high blood pressure, diabetes melhtus and tuberculosis. Excessive eating of there grains causes high uric acid deposits in the system. Therefore persons with kidney and rheumatic diseases should use it with care. Jawar is grown and extensively used in Maharashtra, Karnataka, Madhya Pradesh, Andhra Pradesh, Gujarat, Uttar Pradesh and Tamilnadu in India. It is used as Roti or Bhakri. Compared to rice, jawar is richer in protein but the quantity is not as good as rice protein. Jawar is enveloped with covering of bran that is rich in B complex vitamins, cellulose and a large quantity of Phytates. The flour of the whole gram is rich in fibre and forms a bulk nutritive food which aids easy elimination through bowels. Therefore it is excellent food for constipation. Jawar Roti has to be properly chewed, otherwise causes indigestion. Some varieties of jawar contain excessive amounts of amino acid leucine. The resulting imbalance between leucine and Isoleucine interfere with conversion of tryptophane to niacin causing deficiency of niacin. The excess of phytates interfere with the absorption of calcium and iron from other foods. Since cereal and legume proteins are complementary to each other, by eating-jawar and any legume in ratio of 73:30 will give better nutritional value. Jawar is rich in carbohydrates and poor in vitamin A.
Popping and flaking of jawar implies starch digestibility five times but reduces protein digestibility in flakes. Whole jawar recipes significantly lower plasma glucose levels and very useful for non Insulin dependent diabetic persons. Polished jawar gruel with milk or butter milk is an ideal food for bleeding piles and biliousness and also for deficiencies. Italian Millet– Steria Italica (Botanical Name), Kangani (Hindi), Thenai (Tamil), Korrallu (Telugu), Ralkang (Gujarathi), Kakun (UP & Bihar). Like Jawar, it is also a staple food of the poor people and unleavened bread is made from the flour. The gruel with Jaggery is good for weakness during pregnancy and after child birth, liver diseases, urinary infections, underfed children etc. The poultice of flour is very useful for septic boils and carbuncles.